Been having,"String problems" at outdoor gigs/shows/events? Temperature, humidity, "PESKY" bugs and rain all play a factor with guitar string problems. If you do not take the proper precautions, you can end up with a guitar that will not play as easily as it did indoors. Playing an outdoor gig can be fun. Most guitarists spend their time playing and practicing indoors. So, when the opportunity arises to get some outside fresh air and sunshine, many guitarists will jump on it. This is especially true for players with short summers like Minnesota and Michigan...but Louisiana and Florida might encounter some too. If you have played at an outdoor concert, then you are probably familiar with the issues that can arise. People have focused on protecting an instrument from rain, wind, and harsh sunshine. Others have focused on getting your tone tweaked for an outdoor setting. Yet few, if any have discussed the issues around playability. When you step outside to play your guitar, one of the first things that will happen is a molecular change. Every material known to man has something known as the Coefficient of Thermal Expansion (CTE). The CTE is the measure of how much a material will expand or contract under specific temperatures. In the case of a guitar neck made of wood, the neck will slightly change in profile as it is exposed to different temperatures. This will have a direct impact on the action of the neck. A guitar, with low action, that does not have buzzing frets indoors might have frets buzzing when it is exposed to outdoor conditions. The frets, strings, neck, bridge and nut will all have their respected CTE’s changing with the climate. You will certainly be reaching for the tuner more often at your outdoor gigs. While we are on the subject of tuning, let’s now turn our attention towards the strings. "Sticky Fingers"...there is one particular part of playing outside that does not get much airplay. When the humidity goes up, your hands will become a little stickier on the neck and fret board. There will be considerably more drag on the strings. Shifting positions on the neck will become more challenging. The tone and sustain of the strings might start to change as gunk from your fingers starts to build up on your strings. There are some products on the market today that are used to reduce string drag. The best ones are made from light organic mineral oil. This type of oil does very well for two reasons: A. It lubricates the strings without excessive build up. B. It does not penetrate deep into the skin to soften calluses. When applying, it is best to wipe it on versus spraying. Trying to spray into a targeted area like a guitar neck, outdoors, is difficult. Again wiping the oil on will give better results. If you are not keeping your fret board preserved with lemon oil today, do it. A light application of oil on rosewood fret boards will keep the wood from drying and cracking. The real benefit here is also reducing finger drag when shifting positions. Don’t you just love the smell of those little handy wipe moist towel lets that come in little packets? Be sure to keep a few of those in your guitar case. They are great for wiping off sticky hands while you are outside, or just simply cleaning hands after stage setup. There are pros and cons to using coated strings. In addition to their corrosion protection, another advantage is their ability to reduce finger drag in high humidity situations. They have their place in outdoor gigs. Avoid using lotions on your hands. This might sound tempting at first as lotions can make things more slippery and comfortable. In the end, your fingers tips will soften, and the strings will get excessive gunk build up. The lotion will do no justice to your fret board as it will build up with gunk. Contrary to popular belief, dry cotton cloths to wipe of the strings will not improve the problem encountered outdoors. Excessive wiping of the neck and strings with cotton cloths will remove any natural oils left behind from your hands. This will increase friction and cause more string drag. If you have a lot of sweating and making the fret board slick, then lightly dab the cotton towel on your hands and the strings. If you rub and wipe, that will surely remove any natural oils from your skin, strings, and fret board. Hopefully, these few pointers will make your next outdoor gig more comfortable and rewarding. Requested emailed Questions, Answered here below, Thanks for sending them in! I don't usually cover playing techniques on this site, but I cannot ignore a fellow guitarist in distress. When playing slide, you have to be as precise as possible to get a satisfying sound. You also have to dampen all of those unwanted notes. Make sure that your guitar's action is sufficiently high so that the strings don't touch the frets when you run the slide over them. Experiment with alternate tunings. For example, Open G tuning (low to high, D G D G B D) sounds awesome with slide and some overdrive. When you use your slide, lay a finger over the strings behind the slide. This will help dampen any unwanted notes. Eventually, locking top nuts can wear down, and many players are guilty of over-tightening the Allen bolts on the nut. This causes the string to bite into the little square plates that hold the strings down as well as the metal in the locking nut's base. As you say, some locking top nuts are made of soft cast metal, but that shouldn't be a problem if they're treated with respect. Before you replace the nut, you need to check that your guitar's neck is straight. Follow the list I have below, and you'll be locking and strumming, and rocking too, in no time! A.) Using an electric tuner, tune your guitar. B.) Once your guitar is in tune, look down both sides of the fingerboard to determine if the neck is bent. If so you'll need to straighten it by tuning the truss rod with an Allen key. C.) If the neck is overbent (higher in the middle than the headstock and body ends) loosen the truss rod by turning counterclockwise. If it's dipped (lower in the center) tighten the truss rod by turning it clockwise. D.) Once the neck is adjusted, check the clearance between the strings and the first fret. If they're still too close, you should consider placing a shim under the locking top nut to raise its height. E.) To raise the nut, remove or loosen your guitar's strings and remove the locking top nut. You can but proper metal shims for a locking nut, but you can also make your own by tracing around the nut onto some thin card and cutting out the resulting shape. F.) Fit the card shim in place and reassemble the locking top nut. Retune the strings and check the clearance between the strings and first fret. If it's still too close, repeat step four to add another shim. When it comes to any gig, you will need to be extra prepared, and you'll know what that means, when you feel it. For starters, make sure your guitar, amp, pedals, and cables (audio as well as electrical) are all in working order. If there are any problems, you may need to replace, inorder to ensure your gear being in "tip-top-shape"...meaning put a fresh set of strings on your guitar...Nobody really wants to play with strings that are played out or ready to break. the same goes for any batteries you might have in your pedals and guitar. The basic list you should bring....Guitar strings, a string winder, spare cables, batteries, a screwdriver, a bunch of guitar picks, and replacement batteries. A power strip is also something necessary, since many venues expect bands to run everything off a single power point. Sometimes a back up guitar, should be added to the list as well. A roll of gafffer tape is also useful to bring when taping down your cables...enjoy! Do you have trouble making iPod earbuds stay in your ears? Does the least bit of exercise make them fall out? Do you suffer from crippling anxiety because you're the only one in the room who can't manage the simple act of wearing earbuds? If you are small of ear, you may find that those one-size-fits-all earbuds simply don't fit. They're too big -- or you're too small -- for satisfactory wedging. Yet the cartilaginously well endowed may be E.C.D.S. sufferers, as well. Too big a socket, and those hard plastic discs, ungripped, simply fall out. Fortunately, there is hope. Treatment comes in all shapes, sizes, designs and materials. Indeed, these alternative earbuds may even appeal to the normal-eared, because let's face it: standard earbuds can be uncomfortable. They are three things that your ears are not: hard, perfectly round and uni-size. 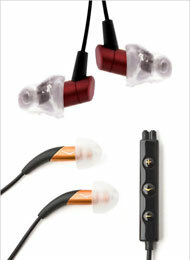 Devices for a better fit: (from top) the Earbudi, Comply foam tips and Yurbuds silicone covers. The first approach is to fasten something onto your existing earbuds to make them grippier or more comfortable. Like EarBudis ($10), for example. (It's pronounced "ear buddies." Ear booties would be something else altogether.) They're rubber over-ear hooks that snap onto standard Apple earbuds. They do hold up the earbuds, but do nothing for their hard, round bigness. If they weren't comfortable before, they won't be now. Comply Whoomps ($20 for two pairs) are narrow foam cylinder extensions for your existing earbuds. Again, the idea is to grip your ear canal more strongly without making you buy new earbuds. Unfortunately, although the foam is grippy, it becomes uncomfortable quickly. Yurbuds ($20) are curved silicone funnels that snap onto standard cheapo earbuds. They make the earbuds softer, increase their grip and enhance the audio. You're supposed to send a photo of a quarter next to your ear so that you order exactly the right size. They work great. However, for the antitragus-deprived even Yurbuds aren't fallout-proof. Over-ear styles include (from top) the Philips SHQ300, Sony's MDR AS20J and Bang & Olufsen. Philips SHQ3000's ($16) are bright orange waterproof earbuds. You can run in the rain, you can rinse them under the faucet, and you can sweat enthusiastically without short-circuiting. They come with a clothes clip (reduces cable strain so they won't yank out), a carrying case and comfortable rubber-dome earbud tips in several sizes. Too bad the sound is so muffled. Sony also makes the MDR AS20J ($13), whose black rubber "hook" doesn't go just over your ear -- it's kidney-shaped, so it goes all the way around. This design is ideal for the antitragus-challenged; heck, these would stay on even if you were also missing your tragus, scapha, concha and earlobe. They sound easily as good as the regular iPod earbuds. Bang & Olufsen's earhook earphones ($160) aren't nearly as successful. They're stylish, of course, and they adjust in three ways: the hook opens and closes, the earbud slides higher or lower, and the earbud rotates in or out. But the actual buds are hard, round disks like iPod's, so they're not comfortable. They also take a lot of fiddling to put on. Sony's streak of successful cheap plastic continues with the MDR AS35W ($20). It's a foldable headband that bends the earbuds right into your ears. Incredibly lightweight (and cheap-feeling), they're incredibly comfortable, and they would stay on even if you had no ears at all. Audio aficionados reject the standard music player earbuds not because they fall out, but because they're cheap and don't sound very good. They'd much rather buy in-ear earphones, whose rubber or foam tips wedge all the way inside your ear canal. That design does more than prevent fallouts. It also blocks external sound, giving you a bit of noise reduction on, for example, plane rides (and making them more dangerous for biking and jogging). And by sealing your ear, these deliver far better sound. The in-ear style of the Etymotic HF3 (top) and Klipsch X10i also help to block street noise. Each type comes with different tips: silicone domes, triple-flange stoppers, foam cylinders and so on. The hope is that you can find a tip type that feels comfortable for long hours and still seals your ear. In-ear phones can cost more than the music player itself -- but that's no deterrent to music fans. It's like a photographer buying a lens that costs more than the camera. The price range is enormous. Skullcandy has a whole range of inexpensive in-ears, like the 50/50 ($45). They come with a cool, colorful and fabric-covered cord, playback/volume controls right on the cable, three sizes of tips and even a microphone for use with the iPhone or iPod Touch. Unfortunately, the sound is nothing like what you'd get with the more expensive in-ear types. In creating its Metal Remix Remote ($70), V-Moda pulled out all the stops to keep them on your head. You get four sizes of tips, a shirt clip and even optional over-ear hooks. (The hooks have "Active Flex technology," which, as far as I can tell, means they're a little bendy.) The only thing that would do a better job of keeping these earbuds in place would be Super Glue. Handily enough, you get playback and volume controls on the cord, too. The Etymotic HF3 ($180) also has cord controls -- and a microphone. These come with a bunch of tips, and you can also pay $100 more to get custom-fitted tips that are molded (by a local audiologist) to your exact ear shape. My favorites were the Klipsch x10i. Yeah, they're $350, but they sound absolutely amazing; at half volume, you get the same sound you would at full from lesser buds. You get five sets of tips, cord controls and a shirt clip. The tips are oval instead of round, and therefore extremely comfortable. Online, people rave about the amazing sound of the Shure SE 535 in-ear buds ($450 -- ouch). They include playback controls on the cord and a whole farmer's market of tips: triple-cone, yellow foam cylinders, and five sizes of black silicone. The first inches of the cord are bendable, so that you can hook them over the tops of your ears. Oh, and they come in a gorgeous aluminum box. These phones feature "Triple High-Definition MicroDrivers." Whatever that means, this extra gear occupies a little lima-bean of a body that's supposed to nestle in (sigh) your antitragus. Basically, I could not make these things stay in, and it's fussy to have to thread the cords over your ears. If you, too, suffer from E.C.D.S., solutions are at hand. If the problem is ear deformity, Sony's over-ear, around-ear or headband-style earphones are dirt cheap and sound surprisingly good. If the problem is the discomfort or size of hard, round earbuds, consider the Yurbuds or in-ear types like the Skullcandy, V-Moda or Klipsch models. You'll face the unafflicted population with head held high, proud to have overcome your disability and entered the mainstream at last. Bank of America................1-800-900-9000.............1 Loan 2 Account 3 Investing 4 Info 00 to a HUMAN Being! Citibank.............................1-800-374-9700............1 online support 2 billpay 3 non online 4 credit card 0 for a human. paypal................................1-650-864-8000..............http://paypalsuckssheeet.com & sign the fing guestbook! CVS.......................................1-800-now-4-cvs....................After prompt, press 6 will connect to store manager. ECKERDS...............................1-800-eckerds........................0 for pharmacy, 8 for store manager. RITE AID................................1-800-rite-aid..........................press 3 to speak to pharmacy. Walgreens.............................1-800-greens4u......................0 for a pharmacy employee. Advanced Auto.....................1-800-314-4243.................0 when the automated message begins. Best Buy...............................1-800-365-0292................00* (sometimes, must press 4, then ext. 2021? Home Depot..........................1-800-677-0232...............when asked for account number, keep hitting "###". Ikea.......................................1-800-434-IKEA..............."0"As many times & as fast as ya can or it will repeat the menu. Kohl's.....................................1-800-564-5740..............After providing account info, press 0 three times. Overstock.com.......................1-800-843-2446...............At the main menu, 0 three to four times to bypass menu. Safeway.................................1-800-safeway.................type 1200 to get a somebody. Sears.....................................1-800-4-my-home............Silence, Don't push any #s Just sit there &You'll be in a queue. Target....................................1-800-targets.................. 0 during the greeting. DHL..........................................1-800-225-5345.................press 1, press 5, press 0, enter phone number. FedEx.......................................1-888-Go-Fedex.................at begining of message say "representative". Apple..........................................1-800-275-2200................if virtual rep answers, say "operator, please"
Cellular One.................................1-888-910-9191............4, # and/or just say "agent"
Sprint PCS....................................1-888-788-5001............00 or say operator or agent please. T-Mobile........................................1-800-T-mobile.............say "representative" at any time. American Airlines.............................1-800-433-7300.....................00, then, say "agent"
Jetblue.............................................1-800-jet-blue........................1 flight status 2 reservations 3 vacation packages. Northwest........................................1-800-225-2525.....................star, 0, 0, ** after intial greeting. Southwest.......................................1-800-435-9792......................Calls answered by operator, many times you hold. United..............................................1-800-864-8331......................Do nothing just wait for human voice to answer. US Airways......................................1-800-428-4322.......................4, wait acouple seconds, then 1. Walt Disney World..........................1-310-867-5309.......................1 direct line to magic kingdom guest relations. Comcast..........................................1-800-266-2278......................0, Customer service, but IVR wants your # 1st! A guy visiting in Hawaii fell asleep on the beach for several hours and got a horrible sunburn, specifically to his upper legs. He went to the hospital, and was promptly admitted after being diagnosed with second-degree burns. With his skin already starting to blister, and the severe pain he was in,the doctor prescribed continuous intravenous feeding with saline, electrolytes, a sedative, and a Viagra pill every four hours. The nurse, who was rather astounded, asked, 'What good will Viagra do for him, Doctor’? SOLUTIONS on How one uses... The infamous F~Bomb~word! Because, after all, if you have to use it, you might as well, make sure it's communicated right & everyone knows what (the f%&$@%&) you mean!!! How About it, for SOLUTIONS, Let's hear it! THANKS!! !